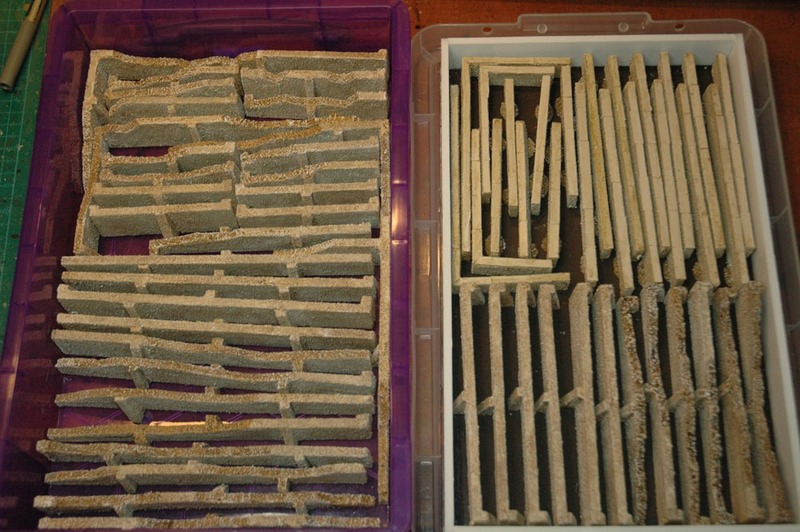 Next up in the scenery campaign, walls – intact and damaged. Pictured with some 15mm Figures – Peter Pig 15mm French. At 1:100 those walls are a scale 3 meters high. The walls were all cut out from foam-board, Buttresses, also from foam-board and a few individual stones were glued on with PVA glue. I give the wall a coat of watered down PVA glue mixed with filler. This helps bind the whole thing together, but is probably not really necessary. A mix of medium and fine railway ballast from Woodland Scenics is added to the top of damaged sections. Then everything else is textured with budgie grit and washed over all with diluted PVA glue. I built the smaller walls using the same techniques, but I used some artists mounting board to make coping stones on the top of the walls and added small bases to hold the walls up rather than the buttresses that were on the large ones. I have made a lot of the things, over 36 feet.